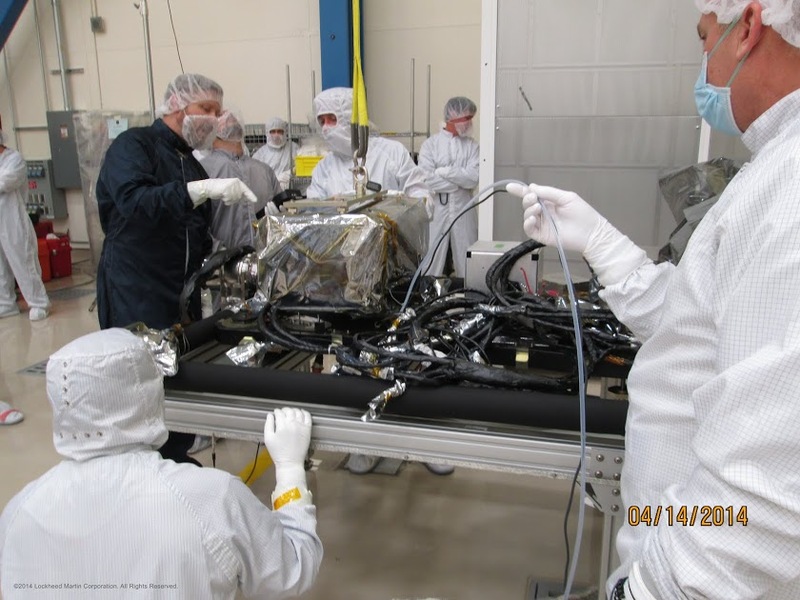 May 29, 2014 – A LASP-built space weather instrument has been integrated with a NOAA satellite. The satellite’s instrument suite will be used to observe the sun and space weather including coronal mass ejections, solar flares and ion fluxes that can disrupt power grids, communication and navigation systems and create radiation hazards. The LASP-built Extreme Ultraviolet and X-ray Irradiance Sensors (EXIS) and a second instrument, the Solar Ultraviolet Imager (SUVI) built by Lockheed Martin, were installed on NOAA’s first Geostationary Operational Environmental Satellite – R (GOES-R). Installation of the SUVI and EXIS instruments moves the program another step closer to the launch of the GOES-R satellite in early 2016. The space weather mission is an important part of not only the overall GOES-R Series Program, but also NOAA’s National Weather Service (NWS), which is home to the Space Weather Prediction Center. Space weather describes the conditions in space that affect Earth and its technological systems. Space weather storms originate from the sun and occur in space near Earth or in the Earth’s atmosphere. Space weather can be difficult to understand since it is unlike the weather we experience here on Earth. In addition to SUVI and EXIS, the Advanced Baseline Imager (ABI) and the Space Environment In-Situ Suite (SEISS) were delivered for integration earlier this year and will be installed on the spacecraft in the coming months. The two remaining instruments that complete the GOES-R Series Program payload are the Magnetometer and Geostationary Lightning Mapper (GLM). Both instruments are scheduled for delivery later this year. NOAA manages the GOES-R Series Program through an integrated NOAA-NASA office, staffed with personnel from both agencies and located at NASA’s Goddard Space Flight Center in Greenbelt, Maryland. For more information about NOAA’s Satellite and Information Service visit: www.nesdis.noaa.gov.